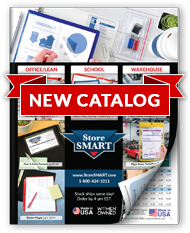 Organize, track, and categorize critical paperwork with StoreSMART's Paperwork Organizers with ID Pockets. Each organizer is sealed on two sides, and includes a convenient thumb notch to make retrieving your paperwork easy. The impressive capacity (one hundred 8 ½" x 11" sheets) means you'll be able to find a home for every scrap of paper in your office or manufacturing facility, while the bright colors will help you and your employees sort, route, and store them. The crystal clear 8-gauge fronts allow you to discern the contents at a glance—but just in case there's any confusion? Each folder includes an ID pocket! Slip a business card or label inside, and never lose track of your important documents again. Front is crafted of 8-gauge crystal clear vinyl; back is crafted of 8-gauge clear/see-thru or 12-14-gauge solid vinyl.